The funeral was held today at Broad and Lombard for popular dirt bike rider Kyrell Tyler also known as Dirt Bike Rell. Tyler was found shot to death last Wednesday, October 15th in Southwest Philadelphia. Police are still investigating his murder. Tyler was a talented rider both on the street and in the arena. Videos of his tricks and rides are popular on social media like Instagram (ig @spdirtbikerell), Youtube, and Vine. Following the memorial this afternoon a large group of close to 100 riders on dirt bikes and ATVs began to make its way up Broad from South to North Philadelphia, weaving its way in and out of traffic, through parks, on sidewalks, dodging vehicles and pedestrians. Members of this "vigil" ran red lights, drove on the wrong side of road, and pulled wheelies down the street. Philadelphia police say they understand that the group was paying respect to their fallen friend but their behavior was unsafe for others. They will not chase riders, but hope to push them off the streets. Not to mention that riding these type of vehicles on the streets is illegal to begin with. The owner of Chickie's and Pete's is now offering a $5,000 reward to find two armed robbers who terrorized employees and made off with $16,000 from the Drexel Hill location on Sunday morning. It happened just before opening at the restaurant on Township Line Road in Delaware County. Surveillance video shows two men enter the store, one was wearing a Chickie's and Pete's shirt. They ordered the manager and three employees into the freezer. They made off with the cash, the manager's wedding ring and purse. Upper Darby Police Superintendent Michael Chitwood believes it may be an inside job. The PHL Live Center Stage Showcase round starts tonight at World Cafe Live. The unique music festival/competition launched by Councilman-at-large David Oh is searching for the best talent in the Philadelphia area. In August and September artists/musicians/bands submitted their applications in one of 10 different genres from country to classical and rock to r&b. Judges chose 5 finalists in each category. Now the finalist will perform at venues across the city over the next two weeks in front of the judges and the crowds for a chance to win great prizes. 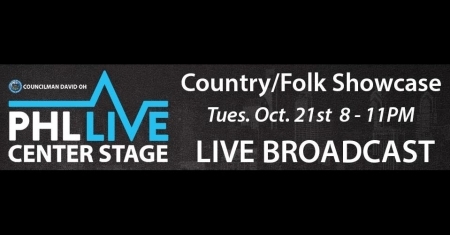 Tonight is the Country/Folk showcase. You can hear every showcase broadcast live hear on iradiophilly. Partly Cloudy, showers later, temperatures in the low 60/upper 50s this evening in Center City.